Sometimes when I slide the width of the columns (from, to, date, etc) all of the individual column widths are stretched. Sometimes they are fixed width – I want that because when they stretch I need to resize all of the columns. How can I force a fixed width? Selecting fixed width in View Settings doesn’t do it. Open View Settings, Other Settings and uncheck Automatic column resizing. When Automatic column resizing is checked, Outlook won't use a scroll bar at the bottom of the window and will adjust the columns widths to fit the window size. If you use Best Fit, Outlook will decide which columns to adjust; if you use a Specific Width, Outlook will adjust the width proportionally to the window size. For example, if you have 5 columns each 100 pixels wide but the window is only 300 pixels, Outlook will adjust them to about 60 pixels each. If the available width is 1000 px, Outlook will stretch the fields to 200 pixels. With Automatic Column resizing disabled, you’ll have a scrollbar across the bottom if the fields won't fit on the screen and Outlook will show a blank space on the right if your fields don't fill in the entire width of the window. 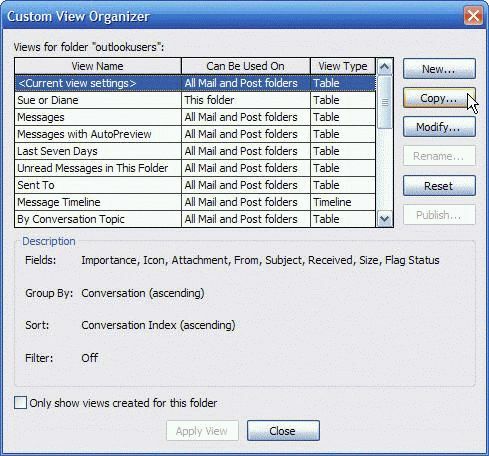 In Outlook 2007 and older, open Customize View to change the column format. This is on the View menu or you can right click on the row of field names and choose Custom (or Customize) from the bottom of the menu. Published August 25, 2014. Last updated on September 18, 2014. Thank you very much! The column resizing was KILLING me. Why that is the default, I'll never know.